Along the rugged east coast of the stunning island of Sardinia lies a trek described as the most beautiful and challenging walk in Europe with its beauty said to be unequalled. 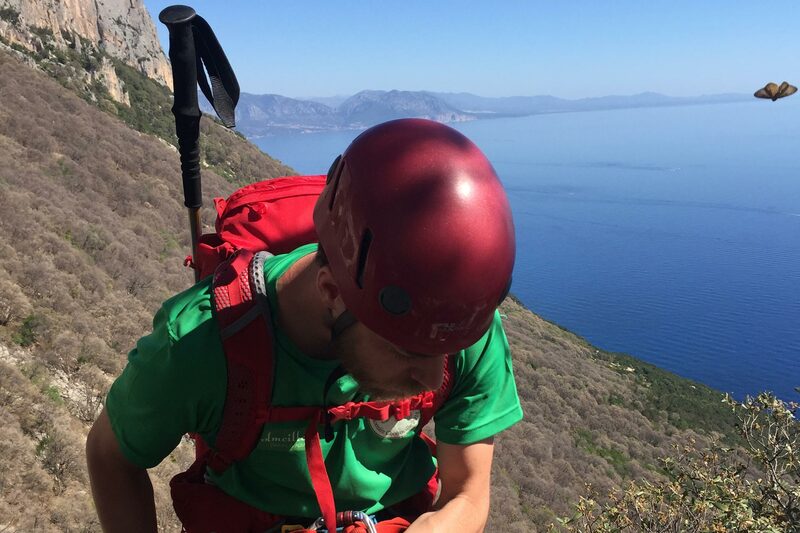 Traversing through the magnificent Baunei Territory, The Selvaggio Blu is sure to be an Adventure of a lifetime. 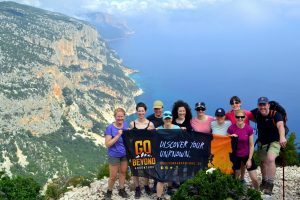 This multi-day trek will have you walking through unique creeks, along cliff tops, across rivers and delving into the Mediterranean Bush. 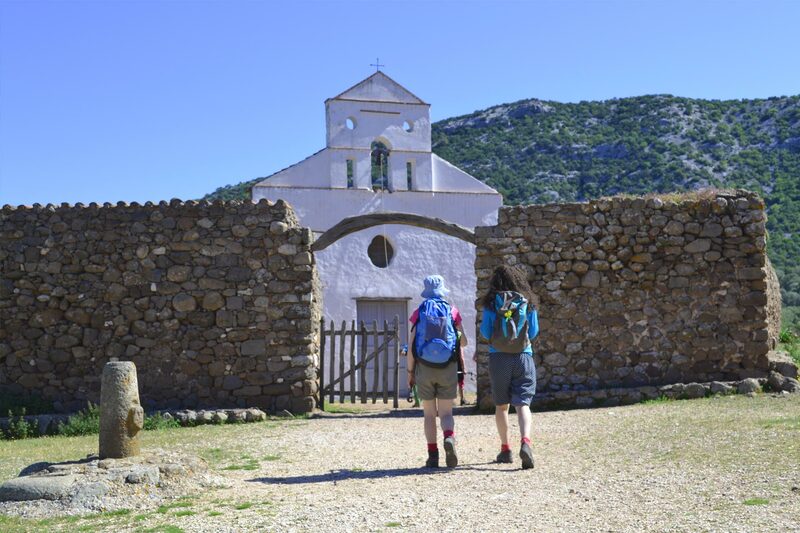 You will cross ancient mule paths, through huge limestone Arches and century old Oak Woods, all the while surrounded by breath-taking panoramas. 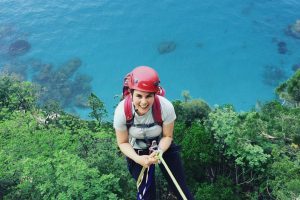 Some of these labyrinthine paths end abruptly at the edge of impressive sea cliffs or deep gorges, making it necessary to Abseil, Climb or use Via Ferrata all of which adding to this wonderful adventure. 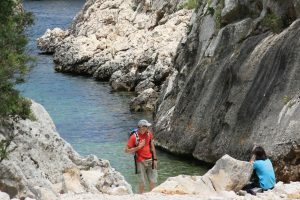 You will cross ancient mule paths, through huge limestone Arches and century old Oak Woods, all the while surrounded by breath-taking panoramas. 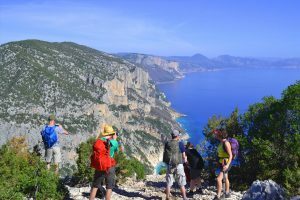 Some of these labyrinthine paths end abruptly at the edge of impressive sea cliffs or deep gorges, making it necessary to Abseil, Climb or use Via Ferrata all of which adding to this wonderful adventure. 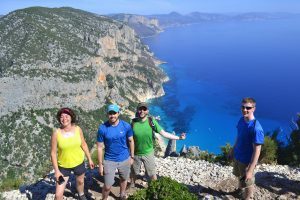 The trek will be led by two local guides who have incredible knowledge, history and experience in the local area and of course on The Selvaggio Blu itself. The group will also have a logistics support crew who will transport the group’s larger bags, sleeping kit, food and water along the way to each Bivouac point. Each group will also be accompanied by our own Irish guide. 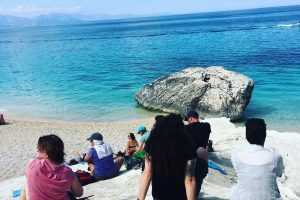 Throughout the trek you will be spending unforgettable nights under the stars, on incredible remote beaches and in wonderful unique and ancient Shepherd-Folds. 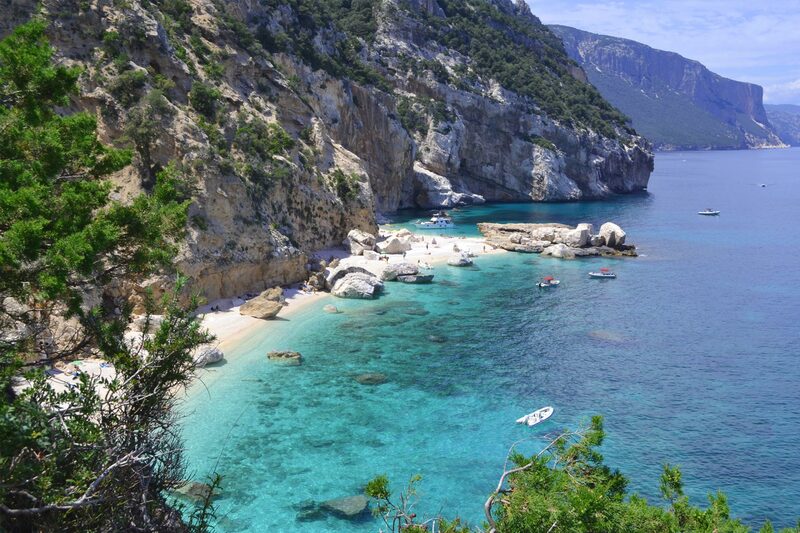 You will be living a truly fascinating adventure on the most isolated Mediterranean coastline. In the mid nineteen eighties, Mario Verin, a leading Italian outdoor and mountain photographer and alpine climber received an invitation from Sard friend Peppino Cicalo to join him in Santa Maria Navarrese where he let him on an idea which he shared with his brother since they were young. 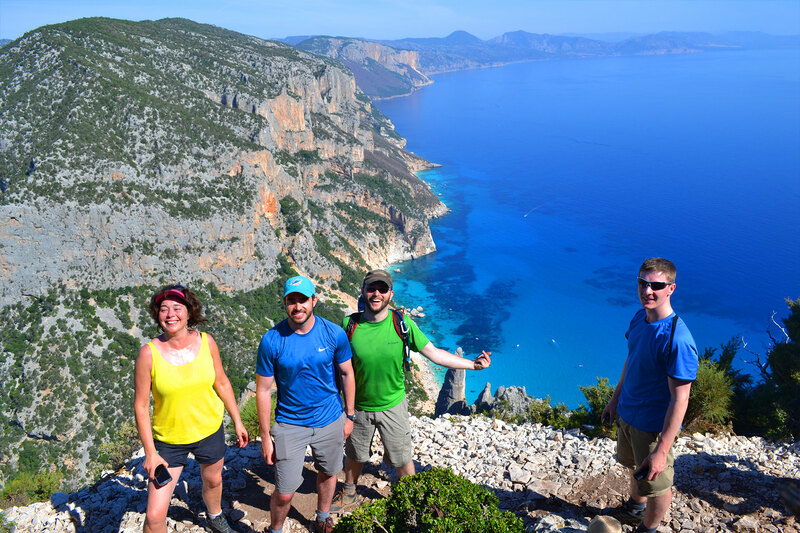 The idea was to walk from Pedra Longa to Cala Sisine following the edge of the cliffs. 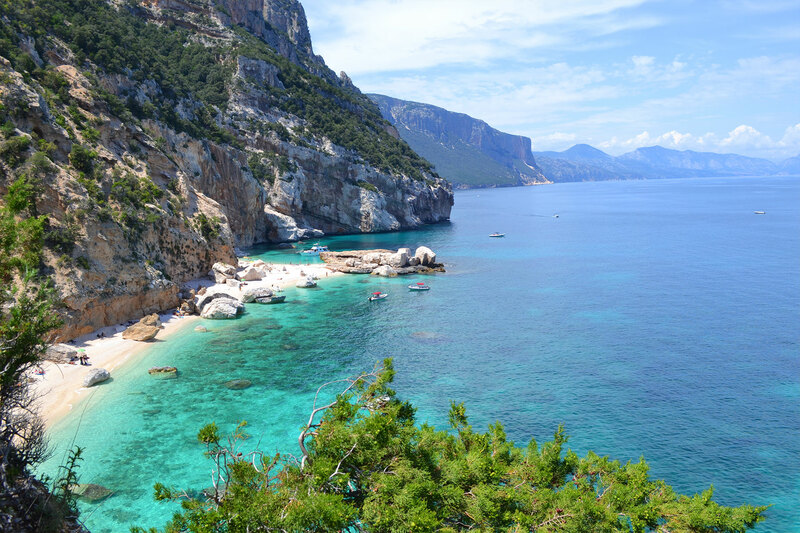 This section of the Sardinian coastline between Baunei and Cala Gonone offers a great contrast between the wild Supramonte Mountains and the crystal clear sea with its rugged and steep limestone cliffs. They set out with the objective to maintain a path for as long as possible along the very edge of the cliffs so as not to lose the thrilling views of the sea and the sense of exposure which are unique to this section of isolated Mediterranean coastline. 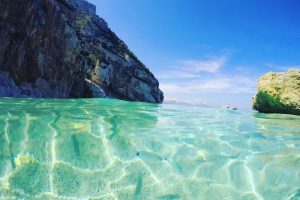 In May 1988, after several visits and a series of explorations, Verin and Cicalo completed the route to Cala Sisine and decided to give it a new name, “Selvaggio Blu”, “Wild Blue”, bringing together the two main ingredients of this extraordinary adventure. Throughout the trek it is fair to say that you will certainly have some wonderfully unique sleeping experiences which massively add to the whole journey. Both first and final nights of the trip will be spent in a quaint and lovely local hotel in Santa Maria Navarrese were you will be well taken care of by the superb local staff members. Once on the trek our sleeping locations will vary with a number of options available. 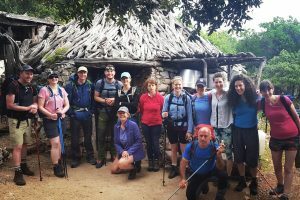 Tents are available and included throughout however these are not always necessary or always wanted by our trekkers with many opting to embrace the opportunity to sleep out under the stars or on a remote beach. On a number of evenings you will have the truly unique opportunity to sleep in an ancient and traditional Shepherds or Sheep Fold. 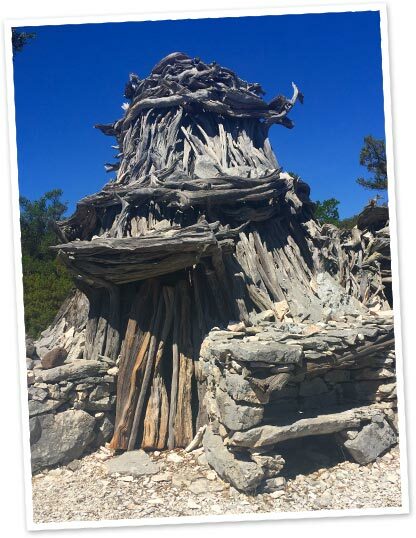 These extraordinary historic dwellings constructed from stone and juniper trunks were the heart of a shepherd’s life. The fold or ‘Coile’ in the local Sard dialect, compromises of a number of parts, each with its own specific function. The heart is the ‘barraccu’ where the shepherd lived and the ‘corte’, the enclosure for the goats. These ancient rural structures are a magnificent example of man’s adaptation to a barren, resource-poor environment which has allowed the shepherds to survive for centuries. You will have the rare privilege of being welcomed in to a number of these remote folds where you will be truly well looked after by the shepherd and their families. 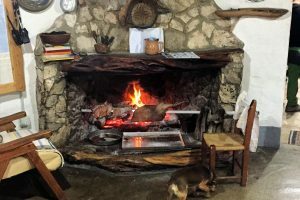 You will dine on their very own home made produce and even sample some of their home made wine. Flights must be booked by each individual trip member. However, we will provide recommended flight details. The average cost of flights for this trip is €150-€200. 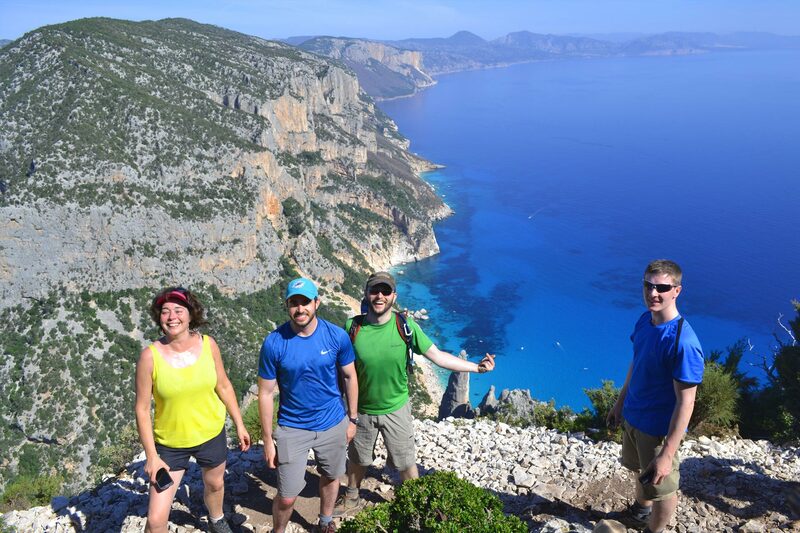 Each trip member MUST have their own Travel Insurance with activity cover for Trekking, Rock Climbing and Abseiling. 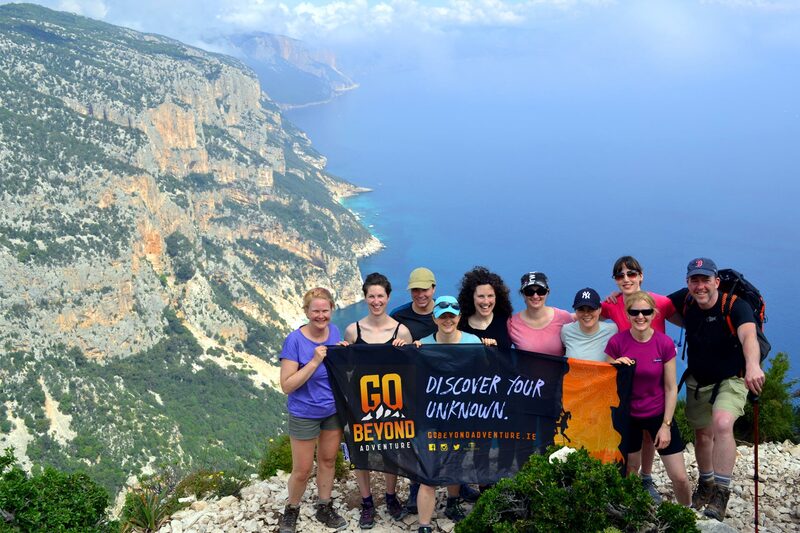 Go Beyond Adventure will require a copy of each members insurance policy prior to departure. All larger Bags will be transported by our Logistics team on the trek. This pack should be kept as small/neat as possible to allow for easier transportation. Max of 20kg per person. You will spend each night on the trek sleeping on your roll/air mat so comfort is key. Your mat will also be transported in your larger bag so don’t be too afraid of carrying a slightly larger size mat. We highly recommend a travel pillow to help you have the best night sleep and rest possible during the trek. Pillows come in many shapes and sizes so it will come down to preference. Shop around online for some good deals. Basecamp in Dublin City stock Thermarest pillows as well as some blow-up pillows. Vango make very small packing blow-up pillows but may not be quite as comfortable as the stuff-sack pillows. We highly recommend Lifeventure trekking towels. 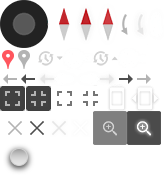 They come in a range of sizes which all pack down very small, even the extra-large size. However there may be cheaper options so also worth shopping around. 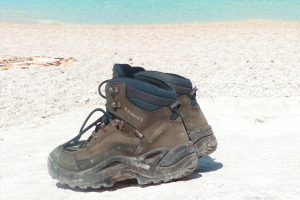 We provide a harness & helmet; however we do request that you pack these in your own luggage. Should you have your own harness or helmet and are more comfortable in these please feel free to carry them. If we are providing equipment for you, you will either be issued these at the training day or at the airport prior to departure. Depart Dublin for Cagliari (Sardinia) via London Stansted. Transfer from Cagliari Airport to Santa Maria Navarrese. The adventure begins! 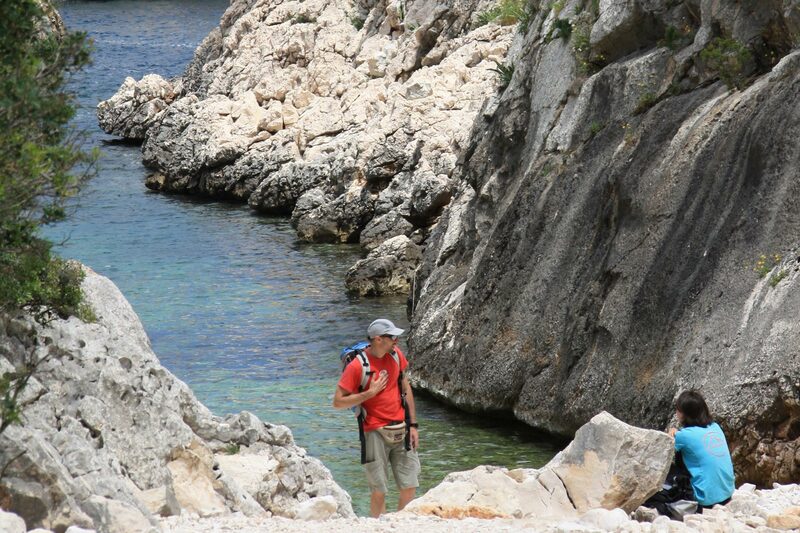 Commence the Selvaggio Blu Trek from Santa Maria Navarrese. Lunch at Cala Luna Beach Bar & Restaurant. Depart Cala Luna @4pm by boat. Boat trip (1.5 hrs) back along the coast to Santa Maria Harbour. Group final dinner & Night in Hotel. Breakfast in the hotel followed by transfer to Cagliari airport. Depart Cagliari for Dublin via London Stansted. Zip-Lock Bags for rubbish etc. It's so hard these days to really get off the beaten track or have an adventure that is truly unique. Not the case with the Selvaggio Blue (Wild Blue) trip with Go Beyond Adventure which is a one-of-a kind, unique adventure with an amazing team, fabulous local food, great walking and views, and unreal beaches (the best I've ever been on in my life). This is a truly special and unique experience that you cannot do under your own steam. 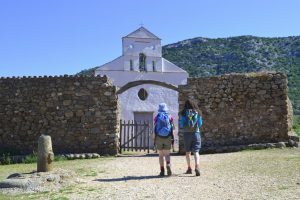 Put it this way - we were guided by a shepherd (Salvatore) who doesn't speak any English and without him even a highly experienced hiker would be lost in this place within minutes! 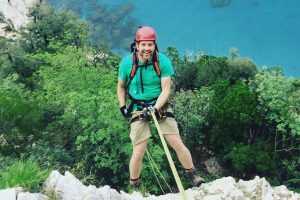 The scrambling, abseiling, shepherd's "bridges", via ferrata (only on one day thankfully for someone terrified of heights like me) added a real sense of adventure to the trip. This is such a personalised trip - you have 3 guides with you at all times. 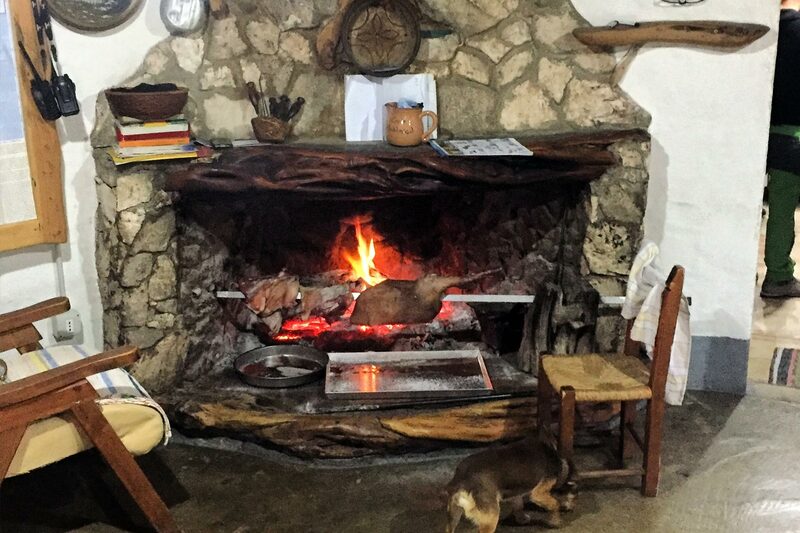 You literally stay in Salvatore's home (a shepherd's fold) and his wife cooks for you. 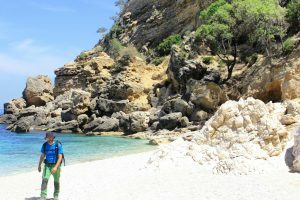 Stefano (the English speaking guide) shares his passion and knowledge of the country and way of life and you can't help but fall in love with the place as a result. Dane, who runs the trip, is with you every step of the way and has somehow managed to put together this amazing team and really does "Go Beyond" in every way. I have traveled all over the world and can honestly say this is a truly unique and special trip. Thank you Dane - you gave me a really great adventure, a bunch of amazing memories and a truly unique experience. The Selvaggio Blu trek provides off the beaten track, unbelievably scenic hiking. Everyday was different - remote beaches, stunning cliffs, abseiling, hiking through forests and high plateaus. The local guides Salvatore and Stefano were friendly, professional and highly knowledgeable, and Dane was on hand to guide us through the abseiling and made sure that everything ran smoothly. The trip provides a great taste for the area - fresh local food and staying at shepherds folds. 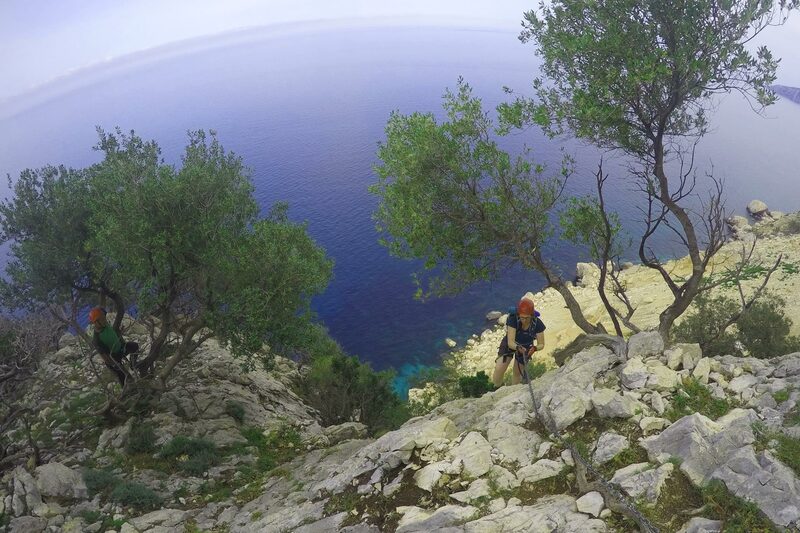 I thoroughly recommend hiking the Selvaggio Blu with Go Beyond Adventures. What a trip! What an experience! Unique, challenging and great fun. 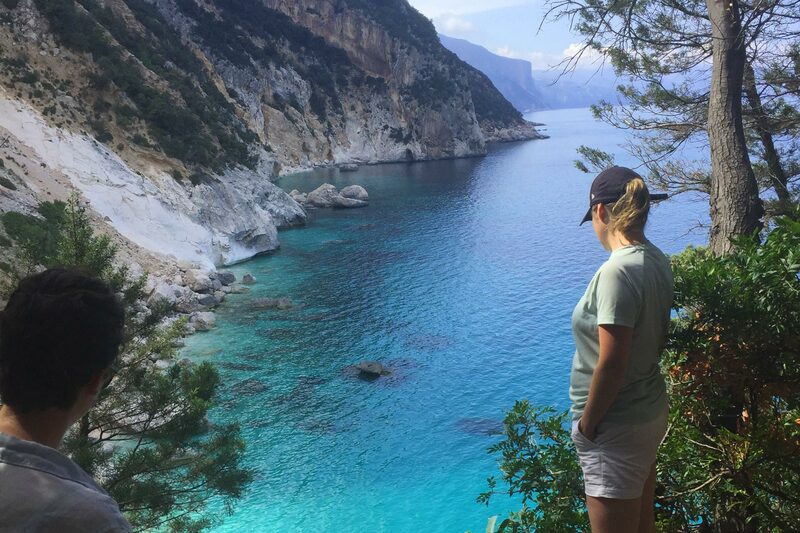 Amazing scenery, fascinating local history, refreshing jumps into crystal clear waters, sleeping outdoors under the stars to the sounds of bleating goats. It was another world. Oh and delicious food ... and wine .... and the laughter ... so much laughing. A year later and I still laugh at the memories. 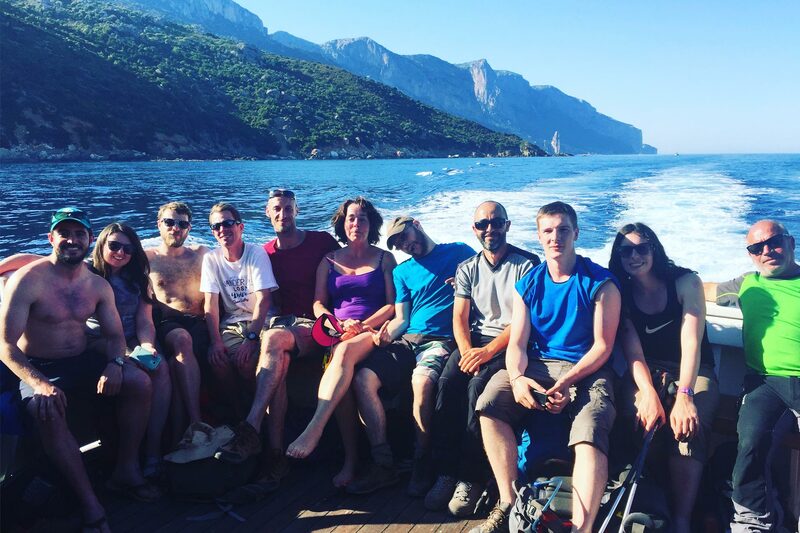 The week trekking the Selvaggio Blu with Salvatorre, Stefano and Dane leading our group was simply the most amazing experience of my life! I had the incredible experience of joining Dane on the Selvaggio Blu trip last year. This was one of the best trips I've ever been on. The scenery was sensational and the local guides and hosts were amazing. We got to sleep under the stars, swim in secluded beaches and hike across this truly beautiful landscape. The organisation and attention to detail on this trip was very impressive. One of the nice touches was the half day climbing training in Dublin a few weeks before the trip. 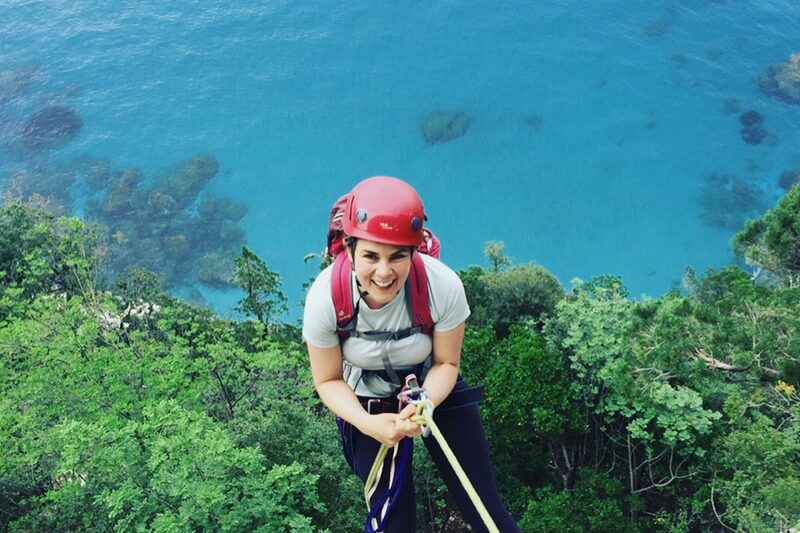 This gave us the opportunity to try out abseiling and get over those initial nerves so we wouldn't waste any time on the trip itself. Was also nice to meet the group before we headed away. This trip surpassed all my expectations. If you love the outdoors then this is the trip for you. Selvaggio Blu on TripAdvisor Read about the Selvaggio Blu Trek on TripAdvisor. 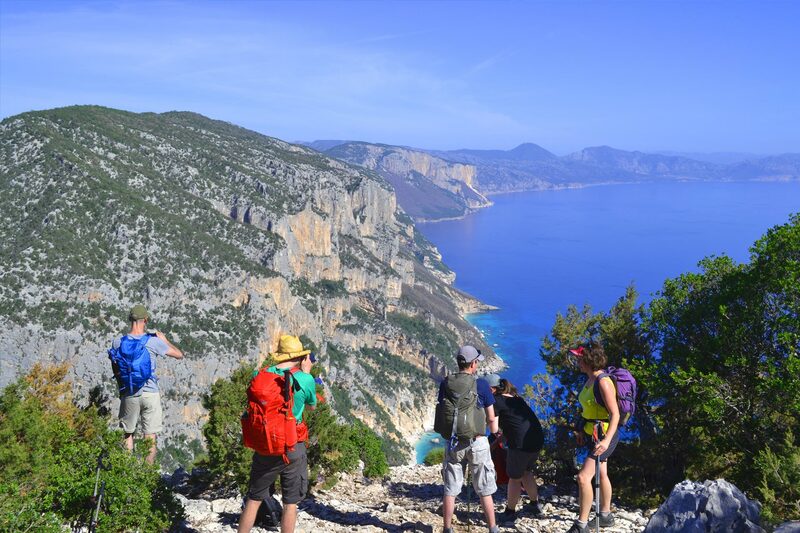 Official Baunei Tourism PageContains useful information and history on the area.